Last year I sat in on Design 2B’s interim review (before shooting off to a work meeting), and there were some pretty good projects but there were a couple things that stood out and I want to talk about just one for now, I’ll get to the others in future posts. There were some projects which featured quite “organic” shapes, which is fine, us students love curves (seeing as we don’t actually have to document it. The issue come about however when they “furnished” the rooms, and I use the term “furnished” very lightly. Many beds are rectilinear, makes sense yeah? A very practical shape, 99.8% of bedrooms are squared (please don’t quote me on that figure as I made it up) so it makes sense to have the featured furniture piece something that can run parallel or perpendicular to the walls. However what do you do when your bedroom wall is curved, all around? Well here is what you don’t do, don’t put a rectangular bed in there. Many architecture students looks at the above in reverse, they first look at the city plan, then the immediate environment around their site. From there they scale down to their building, but a lot of the time that is when they stop, they don’t consider the next scale from the building. The end result of this lack of scale-thinking tends to be rectilinear beds in curved rooms, which makes it very apparent you haven’t resolved the plan. 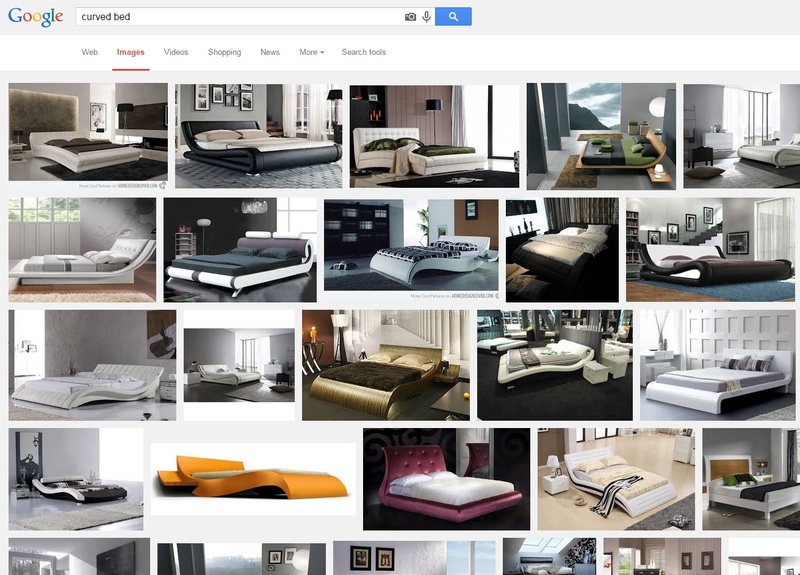 If you Google Image “curved bed” you get the above, which isn’t very helpful for architecture students. Perhaps they thought “Oh maybe I should Google ‘curved beds’ and see what has been done” and perhaps wen they see the lack of curving beds they assume it’s impossible? If you’re designing an architectural masterpiece, you don’t have to grab everything off the shelf. In the real world there is this thing called ‘budget’, yeah never heard of it either but it will determine whether you have a curved bed or not. Is it worth it then to have a curved wall if the bed against it is rectilinear? While you claim “Oh but this curved wall is organic.” I’d disagree and say “Unless your bed is built with the wall, it’s not organic.” Sometimes it is economically viable to get furniture custom made, and even some notable architects designed and had strong beliefs regarding furniture such as Charles Eames, Frank Llyod Wright, Alvar Alto and Mies van der Rohe are just a select few. At times it makes sense to custom made furniture or fixtures, even in the real world! If you are providing a client with a unique space, why furnish it with the same couch and coffee table your next door neighbour has? 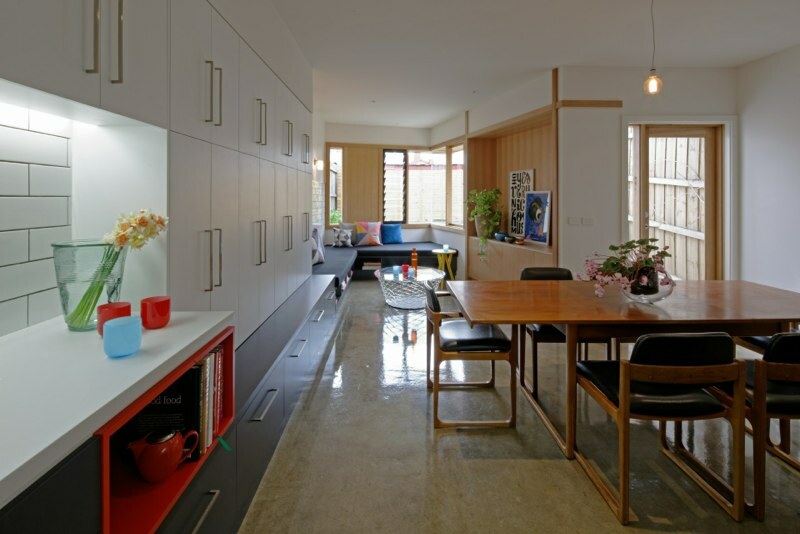 However personally I am a sucker for ‘built-in’ furniture such as what’s in Tang House by 4site architecture, where the architect has built in seating and a day bed which then flows into storage cupboards and then into a kitchen. I don’t think this is available at your local Fantastic Furniture. 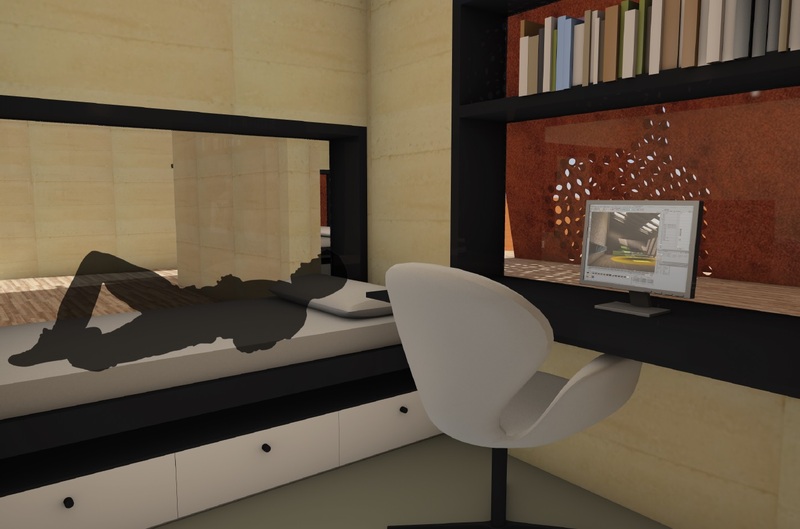 When I did the similar project we were told (after interim, as we were also guilty of using stock-standard furniture) to “design the bedrooms”, not just make a rectangular room and put a bed and desk in but truly design it. Myself and another group member sat down and we thrashed out a bedroom module, where we use the inherent thickness of the rammed-earth wall and make the window turn into the desk and bed. Having the glass effectively flush with the exterior of the frame meant you could sleep “in the wall” and you could truly get a sense of the material and the thickness with it. This bedroom module and these little details are some of more proudest pieces of work. Remember you are studying to be designers, so design everything you can. On a huge urban-scale master plan project, sure don’t design the door handles but design the street lights. On a skyscraper, design the structure. On a house, design the furniture. Just be weary of the scale you’re working with, and if you think that bed looks awkward in the room, either re-design the room or design a new bed.